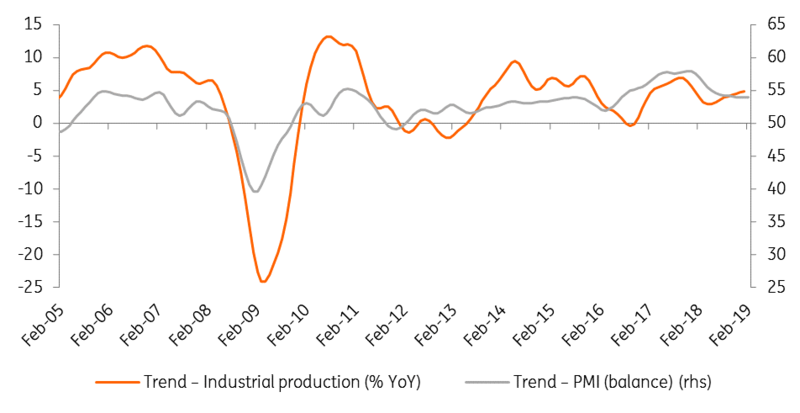 Hungarian industry started 2019 on surprisingly strong form, posting a growth rate of 5% YoY adjusted for working days. This represents only a mild deceleration from the December reading and confounded widespread expectations for a significant drop due to a strike at the Audi factory, the single most important manufacturer in Hungary. Even the month-on-month data wasn’t that bad, at 0.6% (working-day adjusted). So what had happened? The Statistical Office has not yet revealed any details but it has highlighted that the rate of growth slowed down in transport equipment, which holds the biggest weighting in the manufacturing segment. Computer, electronic and optical products also slowed while food products, beverages and tobacco rose in line with the industrial average. Against this backdrop, the three main subsectors saw a deceleration meaning that the mid-weight subsectors had to step up. If the trend seen in 2018 continued into this year, rubber and machinery manufacturing would have increased, helping to counterbalance the missing output from the car industry. 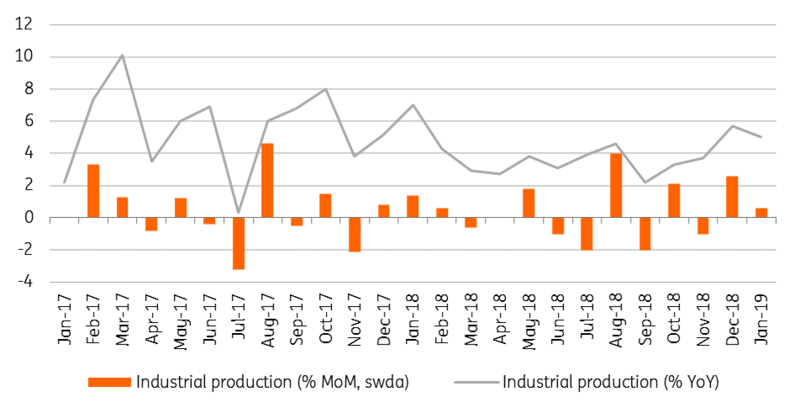 Moreover, as the weather was much colder in January 2019 than a year ago, the energy sector could have also helped to spur industrial production. Looking forward, the strong start supports our view that 2019 might bring a better overall performance than last year's. With the gradual increase of new capacity, we expect industrial production will rise by 4-5% in 2019 as a whole. The risks are rather skewed to the downside, as companies are still facing labour shortages aggravated by the further possibility of strikes across industry. A tariff hike on cars and car parts by the US still cannot be excluded either, which would affect Hungarian industry both directly and indirectly via German manufacturing.